In today’s high-stakes business environment, leading companies—enterprises that differentiate, outperform, and adapt to customer needs faster than competitors—rely on big data analytics. They see how the purposeful, systematic exploitation of big data, coupled with analytics, reveals opportunities for better business outcomes. For mature organizations, big data analytics—together with artificial intelligence (AI) and/or machine learning—is helping solve even more complex business challenges. What separates rainmakers from pretenders is who recognizes data as their most valuable asset, and how to pair this asset with the right people, technology, and analytics. Based on sector-specific knowledge, integration maps, and experience, Teradata solutions are tailored for the unique needs, issues, and opportunities of industries and customized for individual companies. Teradata Global Services spans three delivery organizations to help clients across the entire analytics lifecycle, from strategy and design to support and training, each working collaboratively to deliver unique business value and insight to our customers. We work with you through your entire data and analytics journey, defining precisely how business analytics and actionable insights help fulfill your goals. Our accomplished architects and engineers design and build data and analytics solutions to produce faster time-to-value and clear architectural blueprints for long-term success. The comprehensive managed consulting services we offer support your essential data platforms and applications, while helping you build your own team of experts. Teradata turns the idea of big data analytics into performance and power, designing comprehensive analytics ecosystems and showing clients how to exploit them to boost business outcomes. Because big data is very much a journey, it’s critical to have directional inputs and a map—especially if your organization is entering uncharted territory. The Sentient Enterprise. Why Another Book on Analytics? 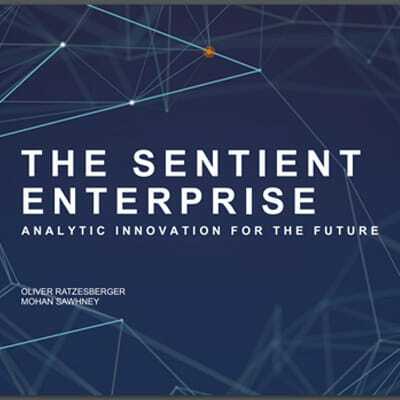 The Sentient Enterprise: Why Another Book on Analytics?